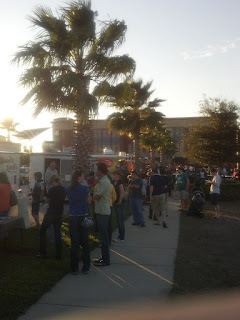 NOT OFFICIAL: 2nd Saturdays Winter Garden: Winter Garden Village 3251 Daniels Rd. NOT OFFICIAL: 4th Saturdays Winter Garden: Winter Garden Village 3251 Daniels Rd. Tuesdays 11am-2pm Trucking Tuesdays, First Church Orlando, 142 E. Jackson St.
Tuesdays 6-10pm Tasty Tuesdays in the Milk District, 2432 East Robinson St.
2nd & last Wednesdays 4:30 - 8:30pm JCC Food Truck Jam, 11184 s Apopka Vineland Rd. 2nd Saturdays 6-9pm: Downtown Longwood Cruise-In, 174 W. Church Ave.